The Democratic Party of Wisconsin is the affiliate of the Democratic Party in the state of Wisconsin. It is currently headed by state party chair Martha Laning. The Democratic Party dominated politics until the late 1850s, followed by the newly founded Republican Party of Wisconsin. The Republican Party held sway for almost 100 years. Jacksonian democracy was strong in Wisconsin in the early days, until 1856 all territorial and state governors were Democrats, except for one Whig. In 1854, however, a coalition of Whigs, Antislavery Democrats, and Free Soilers formed a Republican Party in the state—a key event in the establishment of the national Republican Party. From that point on, Republicans quickly gained control of most elected offices; from 1856 to 1959 there were only three Democratic governors. This period of time would last almost one hundred years, until the Democratic party would gain a stronger foothold within the state. In the late 19th century, the Republican Party was primarily concerned with the special interests of railroads, the lumber industry and the concerns of unionized labor. Along with these interests and the Republicans' ability to accumulate Federal funding for Wisconsin, gained the Republicans the support of many individuals in the working class, along with small business and Populist farmers. In the last decade of the 19th century, the Republican Party's progressive base, which was led by Robert La Follette, began to dominate Wisconsin state politics. The election of La Follette as governor in 1900 was the cornerstone of this movement. Democrats were virtually dormant in the state during this time. The dawn of the 21st century has been a mixed one when it comes to control of state politics. The Democrats and Republicans in Wisconsin have both had multiple occasions of controlling either the State Assembly or the State Senate. The first decade of the twenty-first century has been an even balance between the parties fight for control of Wisconsin. During most of the 2010s, the Democrats were not in control of the governor's office, the Assembly, or the Senate. . However in 2018, Democrat Tony Evers won the Governorship. The Democratic Party of Wisconsin tends to be closely aligned with many of the ideas/ideologies of the national Democratic Party in the United States. While the national Democratic Party has a wider scope of views, the Democratic Party of Wisconsin shares many of the same views which fall under the same ideology. The Wisconsin Democratic Party's ideologies can be classified as liberal, progressive and center-left. Many of these views can be characterized by what the party is calling for relating to the party's social ideals and economic ideals. This can encompass topics such as education, healthcare, foreign policy, environmental issues and labor. In February 2011 the Republican-controlled state legislature, proposed the "2011 Wisconsin budget repair bill" also endorsed by Governor Scott Walker caused much controversy within the Democratic Party and the state of Wisconsin. The debate over first-term Republican Governor Scott Walker's call to stop just short of eliminating collective bargaining for most public employees divided Wisconsin and prompted a walkout by all 14 Senate Democrats. A group of State Senators fled the state to halt the vote on the bill by denying a quorum. The fourteen were Tim Carpenter, Spencer Coggs, Tim Cullen, John Eprenbach, Dave Hansen, Jim Holperin, Robert Jauch, Chris Larson, Julie Lassa, Mark Miller, Fred Risser, Lena Taylor, Kathleen Vinehout, and Robert Wirch. The repair bill ultimately passed after a series of appeals and judicial rulings. An unsuccessful movement to recall Governor Walker began and ended in 2012. The Democratic Party of Wisconsin is a membership organization. Members are organized in 71 county Democratic parties in Wisconsin. Ashland and Bayfield counties are organized as the joint Chequamegon Democratic party. ^ Kinnell, Susan K. The Democratic and Republican Parties in America a historical bibliography. Santa Barbara, Calif.: ABC-Clio Information Services, 1984. ^ a b Alice Honeywell (1984). La Follette and His Legacy (PDF). Robert M. La Follette School of Public Affairs. Retrieved April 4, 2018. ^ Moakley, Maureen. Party realignment and state politics. Columbus: Ohio State University Press, 1992. ^ WALTERS, STEVEN. 2011. 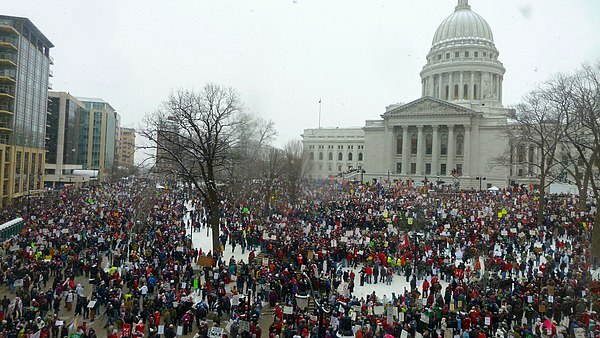 "Showdown in Madison", State Legislatures 37, no. 7: 20. MasterFILE Premier, EBSCOhost (accessed December 5, 2011). ^ "Constitution and Bylaws - Democratic Party of Wisconsin". www.wisdems.org. Retrieved 4 April 2018. ^ "County Parties - Democratic Party of Wisconsin". www.wisdems.org. Retrieved 4 April 2018. This page was last edited on 18 April 2019, at 22:52 (UTC).